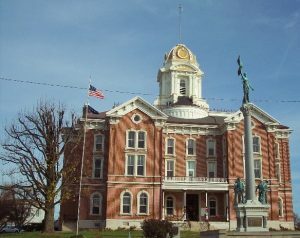 Mediation has been required in the courts of Posey County for over twenty years. The Bar Association members are critical in the successful resolution of matters by the encouragement of fair and equal bargaining between opposing parties in court cases. Last Monday’s Law Day (April 10, 2017) verdict decided the competing interests of North Posey High School students and Mt. Vernon High School students. In the Mock Trial presided over by Judge Brent Almon and decided by a jury composed of Posey County attorneys, the wisdom of reasoning together in good faith was reaffirmed. The real-life attorneys ruled that both teams of student attorneys won. The issue to be determined was which party or parties, i.e., which high school, would have the legal right to auction off the naming of the newly discovered planets of the star Trappist-1. The jury wisely decided that each school could name half of them. As a spectator I was impressed with the hard work, intelligence and imagination of the students from both schools. The excellent supervision and guidance of their teachers, Michele Parrish, Mike Kuhn, Lucy Steinhart and Tim Alcorn, was evident. 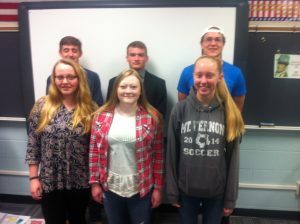 This year’s Mock Trial was the thirty-fifth straight year Posey County’s high schools have participated in celebrating Law Day with the Posey County Bar Association. 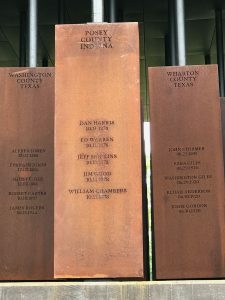 About two thousand students and many regularly practicing attorneys have joined in this important commemoration. Perhaps next year at Law Day you may wish to join us and should you need justice from a Posey County court the Bar’s approach should give you confidence in the outcome. This event is open to the public! 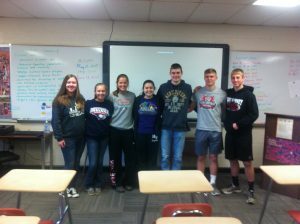 Mock Trial: The annual celebration of Law Day involving the Posey County Bar Association and both Posey County High Schools – Mt. Vernon High School and North Posey High School. On Monday, April 10, 2017 in the Posey Circuit Court a jury composed of attorneys from the Posey County Bar Association decided, that is declared, whether North Posey High School or Mt. Vernon High School or neither of them won the exclusive right to name the newly discovered planets of the dwarf star named Trappist-1. 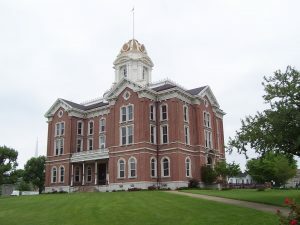 The Mock Trial was the centerpiece of the annual Posey County Law Day celebration during which America contrasts the role law plays in protecting our rights with systems where individual liberties are not paramount. North Posey (A.K.A. Muhammad High School) student attorneys Zack Goebel and Veronica Inkenbrandt pitted themselves against Mt. Vernon (A.K.A. Peacock Throne High School) student lawyers Shane Vantlin and Ashley Ford. The case began when both fictional schools individually claimed to have developed a fund raising plan based on auctioning off the rights to name the seven newly found planets of Trappist-1, which are only 235 trillion miles from Earth. Each school claimed it thought of the scheme first but that the other high school purloined the plan. Jade Hill and Ethan Morlock, Alternates. If you want to know how the students and the Posey County Bar Association celebrated the Rule of Law over military might, you are welcome to tune in here next week. On April 10, 2017 in the courtroom of the Posey Circuit Court the Posey County Bar Association and teachers and students from Mt. Vernon High School and North Posey High School will celebrate the Rule of Law. Law Day was established as a response to the Soviet Union’s military display on May Day. This will be the thirty-fourth straight year the Bar and the schools have joined in the presentation of a Mock Trial in which the teachers guide their students in a jury trial. From 1984 until New Harmony High School closed the three schools rotated portraying the court personnel and each of two sides to a fictional case. Now the Bar Association provides the judge, Superior Court Judge Brent Almon, and the jury composed of attorneys. The two high schools select students who enact the roles of witnesses called to testify by student attorneys who also argue their cases to the jury. The jury of practicing lawyers decides the outcome from which there is no appeal. Over the years over a thousand Posey County students have learned by actual doing how their legal system works. Some of the student attorneys have gone on to become actual members of the Bar. The Mock Trial is open to the public and will begin at 8:30 am on April 10. While cameras and recording devices are usually prohibited in Indiana courts, anyone who wishes to attend is welcome to take photographs and record the proceedings. Next week the Mock Trial case and the names of the participants from the two high schools will be divulged.